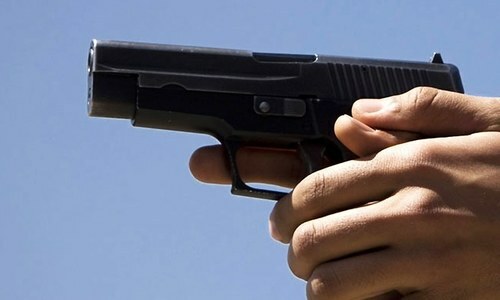 Karachi police on Saturday launched a crackdown against sale of toy guns, a day after Sindh home department imposed a ban on sale of such guns for two months in the metropolis, officials said. Police carried out raids in Bolton Market and Chakiwara and seized thousands of toy guns, said City SSP Adeel Hussain Chandio. The senior officer added that around 22 shopkeepers and traders of toy guns have been arrested. SSP Chandio pointed out that police have received reports that such toy guns were being used by street criminals to carry out crimes. Besides, with Eidul Fitr approaching, the sale of toy guns tend to increase manifold and mostly children buy and play with them, which sometimes leads to their eyes getting hurt accidentally. Thus, toy guns have become a public nuisance, Chandio said. He said cases have been registered against the held suspects under Section 188 (disobedience to order duly promulgated by public servant) of the Pakistan Penal Code on behalf of the State. This should not stop here. The government should ban idealizing war figures as heros from curriculum. Instead our hero should great intellectuals like Socrates, ibn Rushd, Aristotle, ibn Sina. So these shopkeepers and traders, did they belong to MQM? The situation is becoming ridiculous. I guess the gov and police are so lame that this is all they can do. Really shameful that they have no other plans to tackle crime. Somebody really needs to remind our police force that Karachi and Pakistan's problems are not because of the presence of toy guns but because of the massive amounts of real guns. @Faysal Gutkha and Gun: which of the two given is more dangerous and a serious threat to human life ? That's what the poor guys can do go after the toy gun ignoring more important things to do such go search the house of our politician to get the real stuff. Why not go after real guns? We are a laughing stock in front of the world.Toy guns don't kill people.How these toys were imported and who allowed at Custom to enter Pakistan if it is a banned item.Please get all the government officials arrested who allowed these toy guns to enter Pakistan.Courts to take suo moto action and arrest these policemen who raided these shops.Corruption and looting at highest level in the history of Pakistan. Ban yesterday . Raid n sieze today . On a days notice, you make those businesses lose hundreds of thousands rupees merchandise . Bravo! What sort of nation has toy guns?? This is a pretty stresssing factor of any country. "The senior officer added that around 22 shopkeepers and traders of toy guns have been arrested." So now you started arresting shopkeepers too? Sindh government and police is only capable to seize toy guns. I would have loved had they started off with real guns first. We sincerely need to de-weaponize our society. Just a media marketing gimmick and not tackling the real issue. Very sensible decision not only in current climate but at anytime. Good move. Toy guns should be banned once and for all. Young generation is getting too much obsessed with guns and which may have adverse implications in the long run. 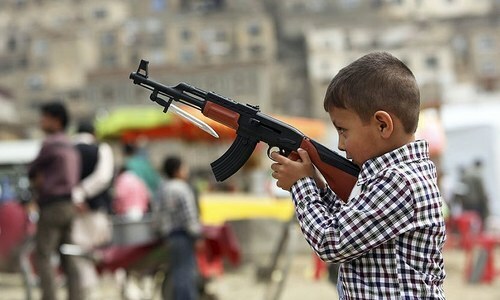 A child firing a toy gun starts dreaming of a real gun and may one day, end up as a gangster. Such toys are really harmful and must be banned even for this reason. the Police arrested the shopkeepers under which law ?? Was there a ban on sale of toy guns earlier ?? If the ban has been imposed yesterday the government should give enough time to shopkeepers to clear their stock or they should buy instead of harassing them. All these tricks will not help...there are no jobs for youth so ultimately they will turn to crime. 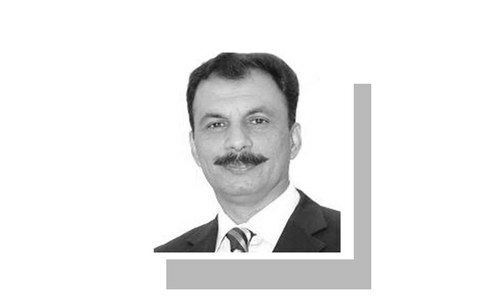 Karachi is the largest city in the world now but we have no one to speak to for our problems. The chief minister has turned out to be a servant of his master instead of people's servant. The suited booted politician mafia wants to keep the youth uneducated so they can rule. Stop these ugly tricks and do the work that needs to be done. Why not try to seize and apprehend those who carry real guns? Good Move to change innocent minds. Kids should not be given such toys. The order is issued just like that, these are poor people doing business for bread n butter in your ignored province and city. Either such toys should be for sale if there is any law for such type of toy sale. If it isn't there is should be a warring or a notice for a certain period of time to remove and stop sale of such toys. It should be like one days you were out for breakfast with friends on official expense and their you come up with this idea. Toy guns should be banned altogether. Its for public interest ,government did well. Crime by toy guns o my God it reminds me of crime master gogo of andaz apana apana movie. Great job!! Now the practice game is over, and time to go after the real guns. It is a good move.All kids toy's depicting violence,should be banned, forever ! Well done Karachi police; "Toy" guns are the reason why we have all these problems in Pakistan including street crimes, terrorism, extremism, corruption and the list goes on. Great to see your highly intellectual approach to finally getting to the root cause of all our problems!!!!!! Why does govt. Ban on imports and manufacturing of these toy guns?